On the 7th December 2017, the Democratic Progress Institute was privileged to welcome the Honourable Mr Kemal Kılıçdaroğlu, leader of the Republican People’s Party, to Dartmouth House in London. 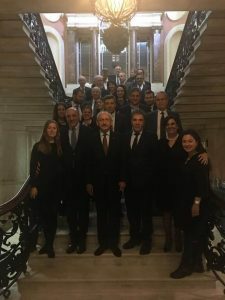 Along with a delegation of CHP party members, the event saw Mr Kılıçdaroğlu engage with an array of experts with wide-ranging experiences of resolution processes, the role of opposition parties and democratisation. The discussion and exchange proved to be very fruitful to all involved. The meeting provided DPI and its advisors with an opportunity to hear the views of Mr Kılıçdaroğlu and his party on the current political situation in Turkey and the wider region. Following meetings with representatives of AK Party and HDP, we were delighted to hold such discussions with the CHP delegation and their party leader. The summary report of this series of meetings, with the three main political parties in Turkey, will be uploaded onto our website soon. Set in the grand Churchill Room at Dartmouth House, our participants exchanged thoughts and opinions on issues such as dialogue, the role of opposition parties and working towards a democratic society. DPI experts also shared their international experiences of the successes and failures of past resolution processes.